Learners can refer to job aids to get assistance for performing any activity or task in an organization. Job Aids can be consumed along with course consumption in Adobe Captivate Prime. A Job Aid is a form of just-in-time learning. It works as quick reference material, for example, like a checklist or a cheat sheet. Job Aids are available as Learning Objects in Adobe Captivate Prime to assist learners in their roles. This article explains how a learner may download a Job Aid. 1. Log in as Learner and navigate to ‘Catalog’. 2. 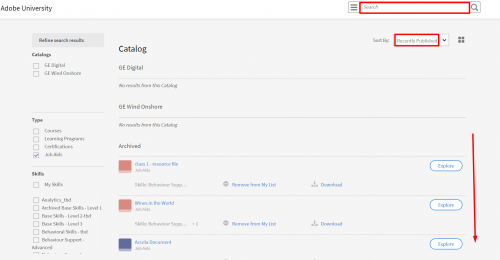 When the Catalog opens, select ‘Job Aids’. If you know the Catalog in which the Job Aid appears, select the Catalog. You may narrow your search further by selecting ‘Skills’, ‘Tags’ and ‘Status’ associated with the Job Aid you are looking for. 3. Scroll through the list of Job Aids or search for a particular one in the search bar. 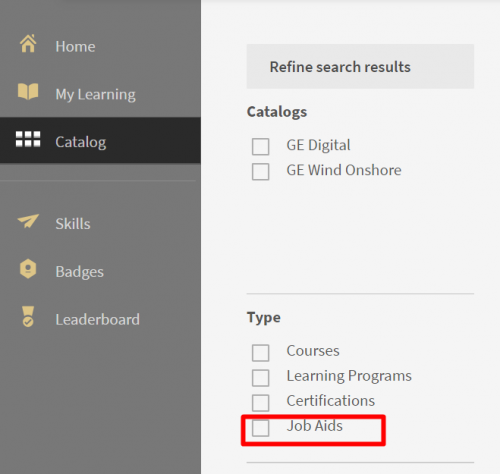 Job Aids can also be sorted alphabetically/according to publishing date/course effectiveness. 4. When you find the Job Aid you want, click on ‘Download’. For further assistance please contact captivateprimesupport@adobe.com. There is an extra period (.) at the end of the Adobe Help page on Job Aids link. It’s causing a 404 when clicked. Thanks Todd, for pointing this out. We fixed it, the same day. Sorry for the delay in response.